A 52-year-old man was commenced on VA ECMO for cardiogenic shock following a large anterior STEMI. He is intubated and ventilated, and requiring low dose inotropes. He is anticoagulated on an heparin infusion. On day 4 of his admission, his free Hb and D-dimer have increased. 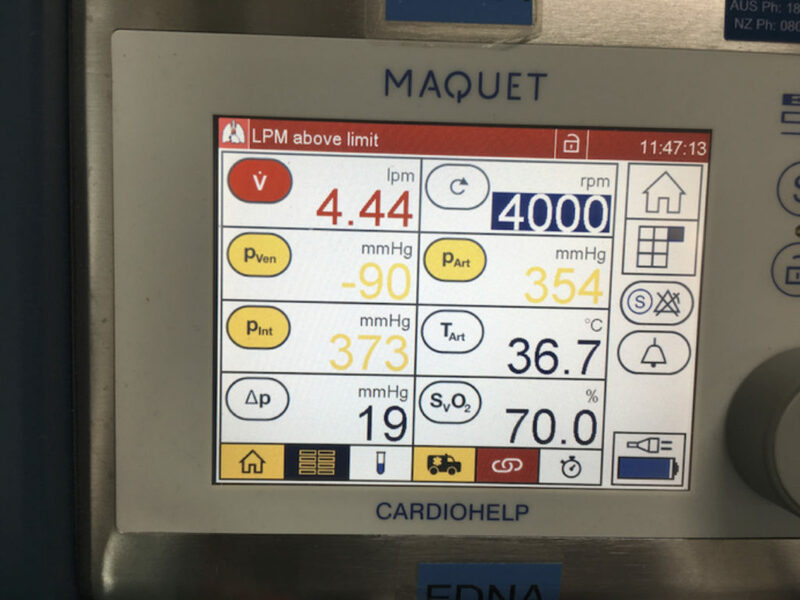 You notice the ECMO flows have fallen from 3.5 L/min to 2.5L/min. Figure 1. Low (2.52 L/min) circuit flows at 4000 rpm. Q1. What is your approach to this problem? This scenario is highly suggestive of severe haemolysis. Haemolysis in an ECMO patient occurs due to circuit or patient-related problems. You look closer and note multiple clots in the oxygenator. His APTT is 64 and stable. See also Everything ECMO 004 for more information about ECMO-related haemoylsis. A succinct review of haemolytic anaemia can be found here: LITFL CCC – Haemolytic Anaemia. Q2. What would you do now? You change the circuit (see Everything ECMO 012 for more information on ECMO circuit changes). His ECMO flows immediately return to normal and his biochemistry improves over the following two days. Figure 2. 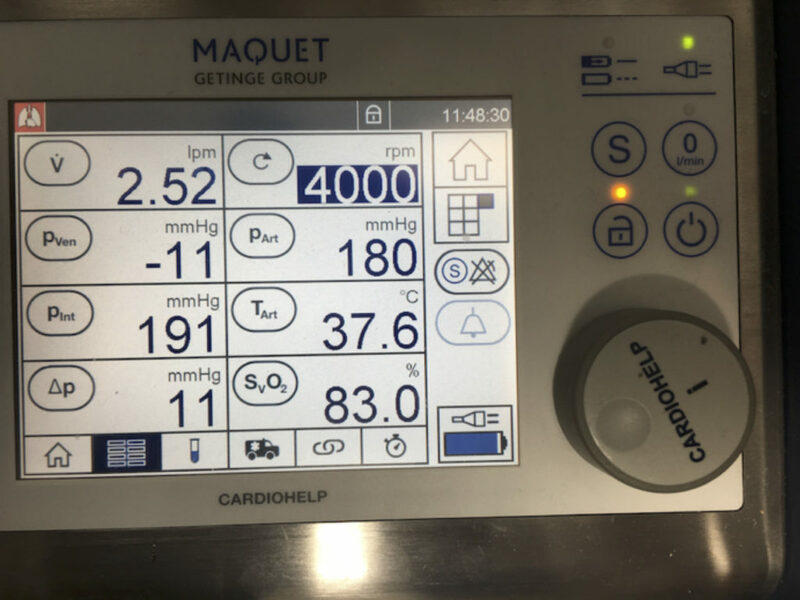 Higher (4.44 L/min) circuit flows at 4000 rpm following ECMO circuit change. Figure 3. Evidence of oxygenator thrombosis, image taken following replacement with a new oxygenator. The patient remains stable on VA ECMO support over the next few days. However on day 7, ECMO blood flows start to decrease again. Further clots are noted in the oxygenator. Plasma free Hb, LDH and d-dimer once again start to climb. The patient is now also thrombocytopaenic, with a nadir of 23 x 109/L platelets. You decide to rapidly exchange a second circuit. Q3. What are the potential causes of this? The patient has developed recurrent clot formation, leading to haemolysis and circuit loss. In addition there is now thrombocytopenia. Differentials for thrombocytopaenia can be grouped into decreased production, increased destruction, increased aggregation, dilution, sequestration or spurious causes. Q4. You are concerned about HITTS. 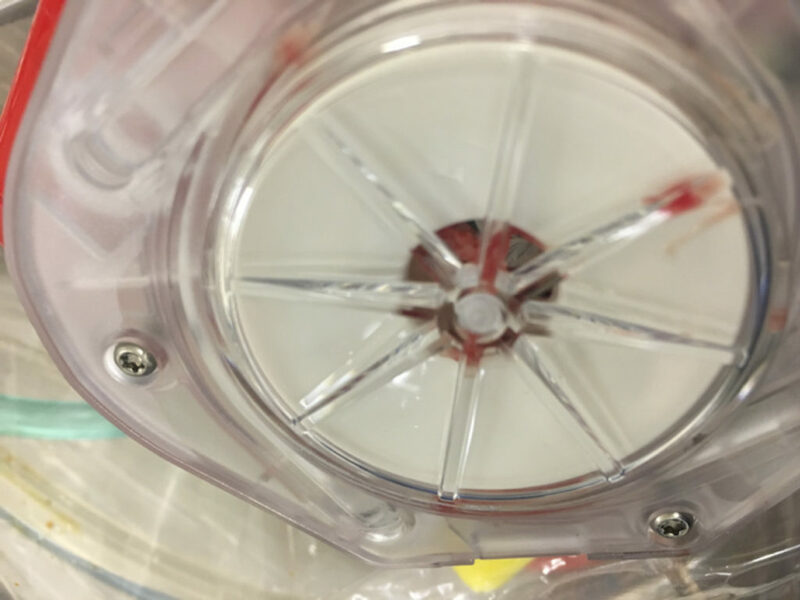 What is the underlying pathophysiology of HITTS, and why are ECMO patients at risk? Heparin induced thrombocytopaenia (HIT type 2) is an immune-mediated condition whereby auto-antibodies to complexes of platelet factor 4 bound to heparin cause a thrombocytopaenia through platelet aggregation. Systemic thrombosis can also occur through platelet activation and endothelial injury resulting in HITTS. Note that HIT type 1 is rarely clinically significant, does not cause thrombosis, and is due to non-immune mediated thrombocytopaenia caused by a direct effect of heparin. 90% of patients with HIT have thrombocytopaenia and 50% have thrombosis which can lead to infarction of any end organ including limbs and skin. The thromboses may be arterial or venous. HIT occurs in about 5% of people exposed to heparin. Those at increased risk include females, patients receiving unfractionated as opposed to low molecular weight heparin (LMWH), and those on high doses of heparin. The incidence of HIT in ECMO has been reported to be between 1-4% (Glick et al, 2015; Laverdure et al, 2016). A high suspicion of HIT is necessary in ECMO patients given an often prolonged exposure to heparin. Furthermore many ECMO circuit components are heparin coated and could potentiate HIT even after parenteral heparin is ceased (Murphy et al, 2015). Q5. How can the diagnosis of HITTS be confirmed in this patient? Note – If the clinical suspicion is intermediate to high, it is important to stop heparin and commence alternative anticoagulation while awaiting the result. The ELISA immunoassay measures levels of antibodies in the circulation against PF4 antigen. HITS is excluded if <0.4 optical density units or confirmed if >2.0 optical density units. Overall the assay is rapid (1-3 days depending on your lab) but unreliable due to a lack of specificity – it has been shown to positive in 30-39% of patients on ECMO despite HITTS having only a 1-4% incidence in this population (Glick et al, 2015; Laverdure et al, 2016). Also, the PF4 ELISA immunoassay often provides an indeterminate result. In this scenario, a serotonin release assay can be performed which helps to either confirm or exclude HITTS. This is a functional test of platelet factor 4 antibodies (it measures the ability of HIT antibody from patient serum to activate test platelets). However it usually takes much longer to get a result and rarely guides clinical management. Q6. How is HITTS managed? Provide anticoagulation (if needed) with a non-heparin anticoagulant (bivalirudin is most commonly used at the Alfred ICU) should be used. Titrate APTT to 60-80 s.
Use a non-heparin-bonded ECMO circuit. The patient should avoid heparin lifelong. Argobatran, fondaparinux and danaparoid are other alternatives to heparin described in the literature. Q7. What is the likely outcome for this patient? HITTS is a potentially fatal condition, however if promptly recognized and appropriate anticoagulation selection is made it is a completely reversible process. HITTS antibodies can persist for two to three months post HITTS, however, despite this platelet count generally resolves within seven days of cessation of heparin. If platelet counts do not improve within this timeframe an alternate cause of thrombocytopaenia needs to be considered.